A small cubesat will carry capsules of ash through the heavens. 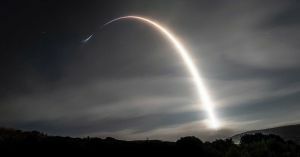 A San Francisco-based company called Elysium Space plans to launch the cremated remains of 100 people into space on a SpaceX Falcon 9 rocket. For $2,500, the company will launch your ashes — along with those of 99 of other deceased people — in a four-inch satellite called a CubeSat, which will be released into orbit along with other companies hitching a ride on the Falcon 9, CNN reports. It’s expected to burn up in the Earth’s atmosphere in about four years. The launch was originally slated for November 19, but the company pushed it back and no date is currently set. The off-world memorial does have precedent, though: in 2012, a different startup called Celestis sent the remains of 320 people, including “Star Trek” actor James Doohan, into orbit. It’s a nice image to know that your loved ones, some of whom may have once dreamed of being astronauts, are floating serenely through the night sky — even if each CubeSat is shared with 99 other people’s ashes.